We love Reese's Peanut Butter Cups! We don't eat them often because I'm anti-all the garbage additives. So, I thought I'd give this refined sugar-free recipe a try (unlike usual, I followed the original without any alterations). 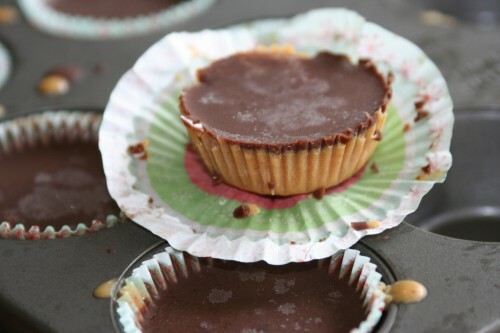 While they aren't Reese's, per se, they are sweet, peanutty and chocolatey, all good things! :) With coconut oil in the ingredient list, these definitely have coconut undertones, if that's not your thing, you could try butter and see how that works. If you want a thicker layer of chocolate (I think I might), just double the ingredients for the chocolate layer. I hope you enjoy! For the peanut butter layer: Line mini-muffin pan with papers. Melt the coconut oil, then mix together with the peanut butter and honey. Carefully pour into prepared pan. Place in the freezer while preparing the chocolate. For the chocolate layer: Melt the coconut oil and butter together. Add the cocoa powder and the honey. Stir until smooth. Remove the pan from the freezer and evenly pour the chocolate into each cup. Freeze for at least 15 minutes before serving. Store in the fridge or freezer. Makes about 24. Mmmm... these look fabulous! You could use the expeller-pressed coconut oil if you want to avoid the flavor. I might have to give this a shot for the next time hubby wants a little sweet treat!